All transactions are safe and secure with a reliable history in online purchasing behind each of our associates. 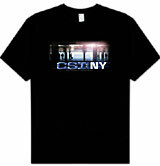 Buy the CSI: NY t-shirt to own CSI clothing and merchandise. Four years after the original TV show premiered, CSI New York became the second spin-off drama to carry the Crime Scene Investigation title. This time around, actor Gary Sinese takes the helm as Detective Mac Taylor, a widowed scientist and former marine. The front of this CSI t-shirt displays a logo for the New York series. Watch Mac run his team of forensic investigators by the book. In addition to the CSI: NY tee above, browse the CSI Clothing Gallery for more apparel like men's and women's clothes, kids shirts or hoodies.